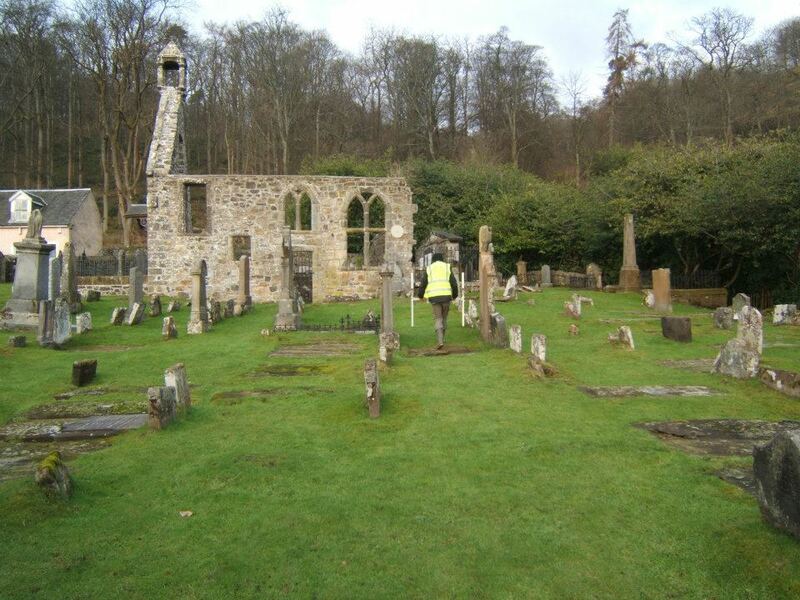 We were delighted to get the opportunity recently to work with Murray Cook of Stirling County Council as part of a research project looking at the sites of St. Ninian’s United Free Church in St. Ninians and Logie Old Kirk on the road to the Bridge of Allan. Not only did it give us an opportunity to showcase our unique geophysics carts, but it also allowed us to share these new techniques with the local community. We were at the churches to see if there was any surviving evidence to suggest they rested on earlier religious sites, possibly stretching back to Roman times. Stirling actually spent a brief period as part of the Roman Empire, and for about 20 years in the 1st century AD was part of the northern frontier of the ‘civilized’ world. There is some circumstantial evidence to suggest that the sites may date to this period- both are associated with oval graveyards, often an indicator of an early site, and two Norse hogback stones are present at Logie, suggesting a date at least as far back as the 10th century. The placenames also provide a clue; St. Ninian’s was originally called ‘Eggles‘, a corruption of the Latin ‘Eccles’ or ‘Ecclesia’ meaning ‘Church’, while Logie may be a corruption of ‘Locus’, meaning ‘Place’ in Latin, and in this instance a possible holy place. We were on the hunt for oval enclosing ditches that would provide evidence that these were indeed early sites. We were disappointed at St. Ninian’s, where modern interference prevented clear results. However, this gave us an opportunity to illustrate the techniques of archaeological geophysics to the pupils of St. Ninian’s Primary School, who demonstrated that they may make useful members of future archaeological survey teams! 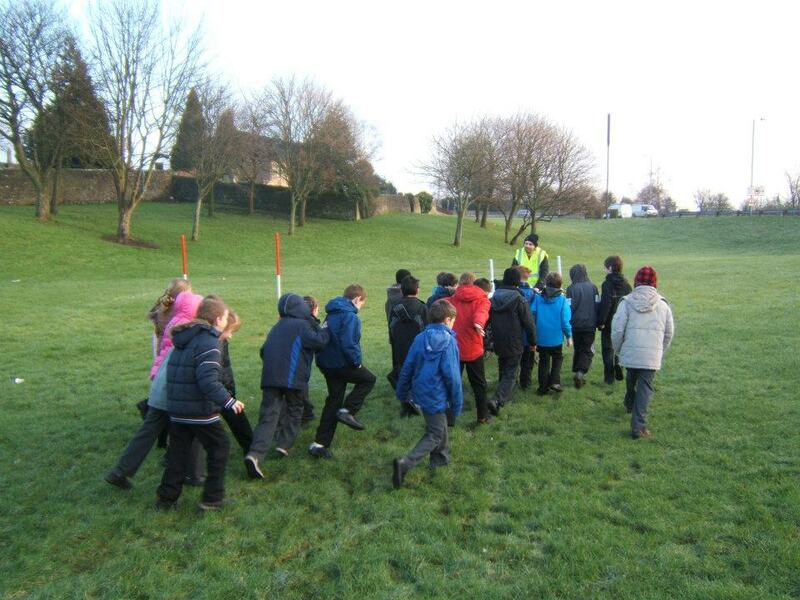 The pupils of St. Ninian's Primary School show their enthusiasm as budding archaeological geophysicists! Moving on to Logie Kirk we met up with the Logie Old Graveyard Group to examine the site. We came up with a strategy to traverse between the headstones within the graveyard to see could we locate any evidence for the enclosing ditch. The survey produced a number of anomalies that are of interest, and further work may revealed that one of them is the ditch we are hoping to find. 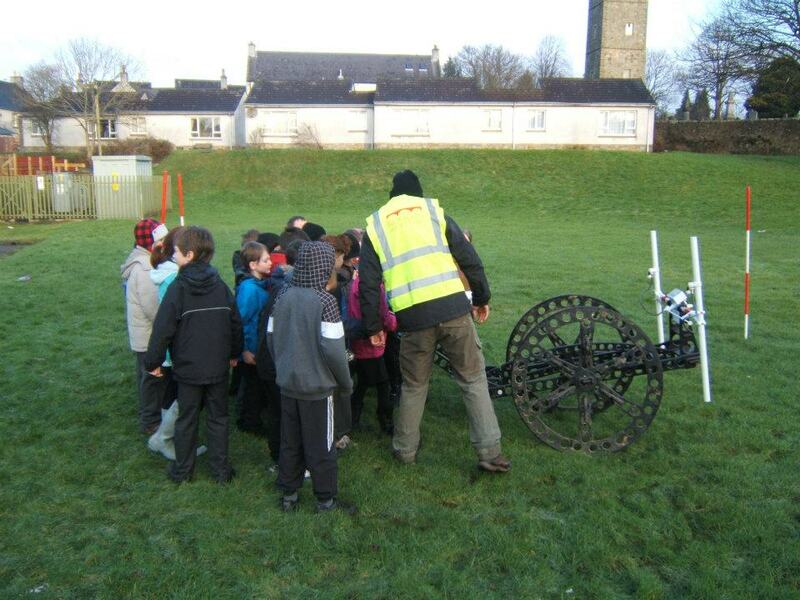 As with the pupils at St. Ninian’s, the Logie Old Graveyard Group were eager to find out more about our equipment and how our geophysics cart works. 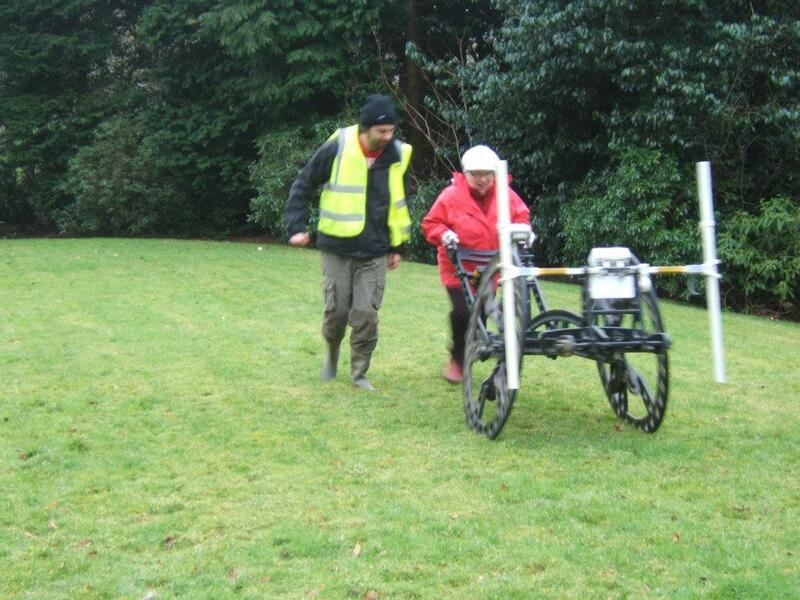 They also helped with the work and had tried the cart out for themselves. One of the members was even kind enough to allow us to survey on her front lawn (as well as supplying a very welcome cup of tea and biscuits!). We have carried out some initial processing of the work at Logie and have identified a possible circular arrangement of targets. We are hoping that in the future we can have a more detailed look at them to see if they will finally reveal the early origins of this impressive site. Many thanks to Murray Cook and everyone in Stirling for involving us in the project! 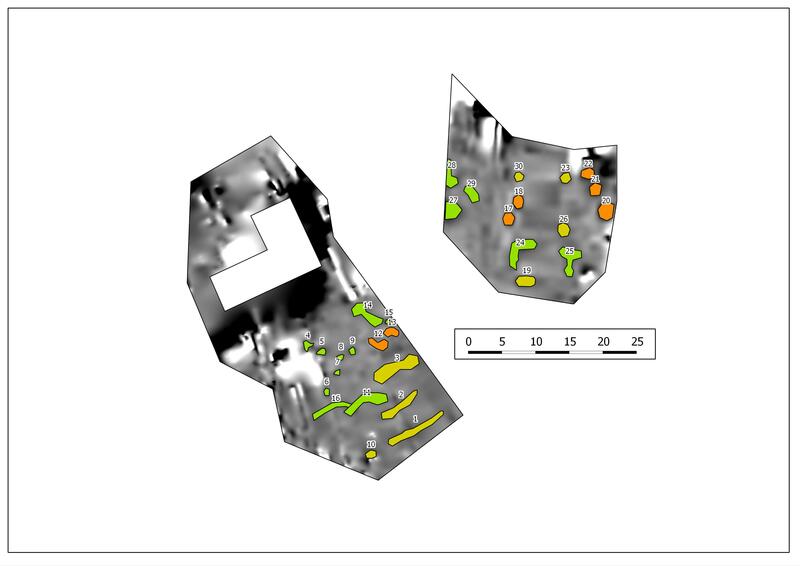 This entry was posted in Archaeological Geophysics, Archaeology Scotland, Rubicon Heritage and tagged Archaeological Geophysics, Archaeology England, Archaeology Ireland, Archaeology Outreach, Archaeology Scotland, Geophysics Scotland, Outreach Scotland, Rubicon Geophyiscs. Bookmark the permalink. Ah! Beautiful Stirling! Sounds like a great project – do we have such projects in Ireland? Well done,Rubicon!